For the sake of argument, I’m counting Blake Griffin as a RC in 09/10 because that is where his RC cards are found. I was writing a review of 2010/11 Panini Classics Basketball the other day and it kind of dawned on me that there is a pretty big gap between what people are willing to pay for a John Wall RC over any other player. While this is not all that unlikely to happen, it is strange that the trend stayed true all NBA season. DeMarcus Cousins, Landry Fields and others got some love during the season … but for the most part basketball collectors were focused on Blake Griffin and John Wall this season when buying rookie cards..
John Wall did have a real good rookie season, but many NBA rookies had solid seasons too. With Wall and Blake Griffin setting a pretty high price bar, some of these guys that are selling for much less might be able to see a boost in 2011/12. #1 DeMarcus Cousins This guy had a real solid season and put up good numbers despite being iced by the coach/team on occasions for disciplinary reasons. He also was in foul trouble (as most rookies are) some games, but still managed to average close to 30 mins per game. Cousins could benefit from either the Kings moving to Anaheim or returning to Sacramento with an anticipated rejuvenated fan base. Both of those things mean more attention to his play & RC cards. The Kings are also slated to have another high draft pick, so potentially they could have Cousins, Tyreke Evans and a crew of solid talent around them. While his somewhat erratic behavior concerns me a bit, his production on the court doesn’t … and I think he will be given plenty of time to grow in Sacramento. This guy probably won’t average 20 points in his career, but his steady play will have fans in Detroit collecting his cards. The key with Monroe, is that his play seemed to get better as the season went along and the Pistons had trouble with injuries/suspensions. With Ben Wallace on the way out, Monroe should step right in and play big minuets in 2011/12. While I don’t anticipate a huge move upward in his rookie cards, I think collectors will recognize his steady play and want to add him to their basketball card collection. 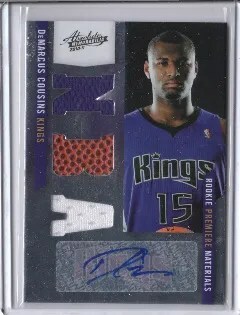 Played well in spurts during his rookie season, but not well enough to get collectors to spend big money on his cards. His performance during the 1st round of the NBA playoffs against the Miami Heat did bring some encouraging signs to what he might be capable of doing next season. Much like Greg Monroe, I don’t see Turner’s cards going through the roof next season (although his upside is greater) … however, I feel collectors will start to pay more for his cards next season if he plays more consistent game to game. People that know me well, know that I love this guys game. He’s either going to be an 18+ PPG player, or nobody in the NBA. He seems to thrive when he is a featured part of the offense, as he didn’t start playing big minuets until he was traded from Atlanta to Washington. Towards the end of the season, Jordan Crawford was playing quite well in the starting position when Nick Young went down for the season. Its possible he doesn’t get the playing time next year to move his card values, but the upside is certainly there. If given 30+ mins. per night, he could average 20+ points. However, if he doesn’t shoot the ball well or the Wizards draft another prospect in the 1st round at the G position, he could see his minuets cut. After getting bounced in the 1st round of the NBA playoffs, the San Antonio Spurs are a team that might go through a ‘re-building’ process. The pain of having a solid regular season, followed by an embarrassing loss to the Memphis Grizzlies might cause the upper management in San Antonio to make changes this off-season. The Spurs have many ‘aging’ players at the guard position, including Richard Jefferson, Manu Ginobili and Tony Parker. One player that could sneak into the lineup if the Spurs loose some veterans is rookie guard Gary Neal. At times during the season Neal played well. His numbers projected out to 48 minuets places him near the top of all rookies in production …. but he has to get minuets to make an impact. Its possible the Spurs come back with the same team and Gary Neal is stuck on the bench, however its possible they re-tool and give guys like Neal a chance to play major minuets in 2011/12.